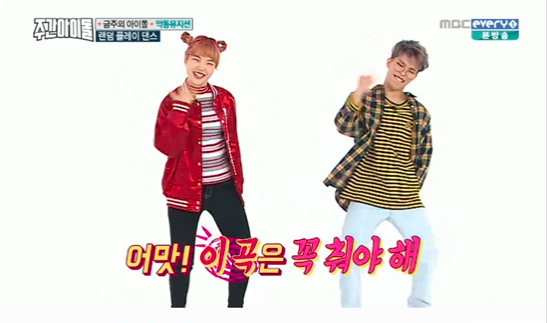 Best of Weekly Idol Random Play Dances. Most Kpop fans already know about Weekly Idol, a Korean variety show begun in 2011 as a short term show that is now 6 years old. Filmed in a sub basement against a white background with minimal props, the show relies on the humor, personality, and talent of both the hosts and the guests. Even if you’re not a fan of Kpop you can still watch this show and end up laughing at some of the antics on screen. The format of the show includes ‘corners’ where different activities, interviews, or games take place. Probably the most popular corner is Random Play Dance. This is when short segments of songs are played and the guests are expected to dance the choreography without mistakes. Usually the songs played are those of the guest group, but if the group is new, or without many songs to their credit, then songs from other artists might be played. If mistakes are made then the person making the mistake is punished in some way. Sometimes the person who made the mistake can talk their way out of the punishment , blame someone else, or try to cover it up. 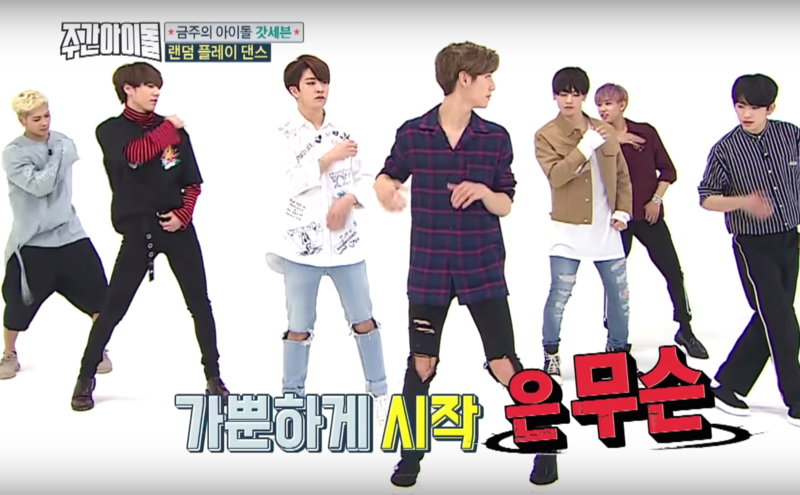 In September 2016 Weekly Idol asked fans to rate the best of the Random Play Dances, with over 93,000 fans voting this was their ranking of the top 7 groups/soloists. I don’t have any problem with this list as these were all great segments although I would rank them a little differently and add a few other groups…. Teen Top. Famous for their self corrections of members mistakes that were so ‘enthusiastic’ the broadcasting company stepped it and said they weren’t allowed to play like that anymore. 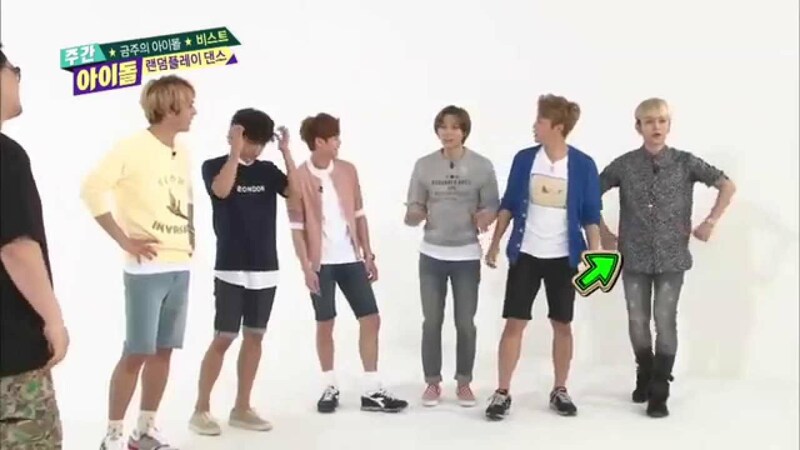 Classic Teen Top moves included flying kicks that would do credit to a martial arts movie. Always a go to watch after a really bad day. BTS. In many ways this group is the best in that they are fantastic dancers performing difficult choreography, but I’ve put two groups ahead of them on my personal list because their ability to make me smile edges out ability. Not that BTS were perfect in their Random Play Dances or didn’t make me smile, they just are a little lower on my personal list. BTS are a force to be reckoned with and have 2 songs with over a million MV views on Youtube. I love watching them dance and do watch their dance practice MVs fairly frequently. Beast. It is funny that some of the ‘best’ or favorite Random Play Dances are not the most perfect ones, but rather the ones with mistakes and funny moments. It seems every group has a ‘black hole’ who can’t remember the dance moves under pressure, yet we’ve seen them countless times in concerts and live music shows where they perform beautifully. 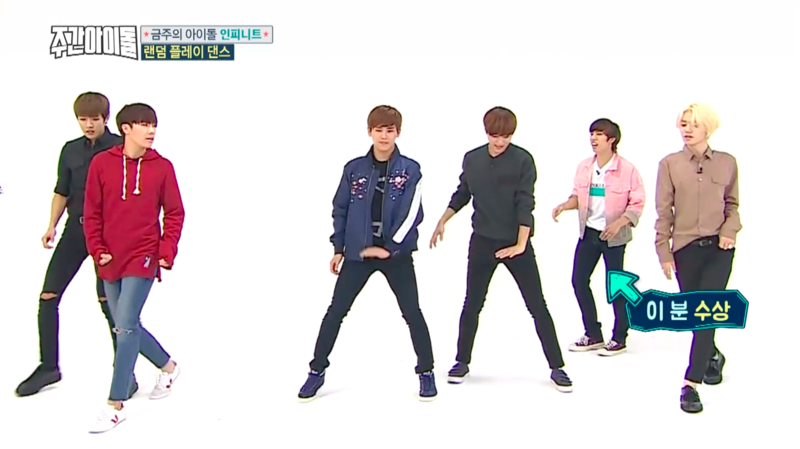 Infinite has been on Weekly Idol multiple times and their leader Sunggyu is not only a ‘black hole’ as a dancer, he is probably one of the most bullied group leaders in Kpop however it seems to be good-natured and it is always enjoyable watching them perform on the show. Lee Hi is an unexpected addition to my list as it is often difficult for soloists to hold the full attention on a minimalist show such as Weekly Idol, especially as it was only her second ever variety show appearance. She was just so cute that I’ve put her on my list as everyone should just check out her episode. She also did well dancing to BigBang songs as well as her own during the Random Play Dance. Super Rookies. An episode made to showcase rookie groups KNK, Astro, and 4Ten who did the Random Play Dance to a variety of popular Kpop songs. This one is on my list to showcase some newer talent, and because it was fun to watch. EXO (and Seventeen) deserve a place on the list just because of the shear number of members within each group. Just trying to get everyone to the correct place before then can begin to dance is hard enough, let alone successfully dance the group choreography. AKMU was another YG Entertainment group that appeared on Weekly Idol and did very well. It was nice seeing the sibling duo interact with each other. I especially enjoyed some of elder brother Lee Chanhyuks side-eyes at his sister. They were surprisingly fun to watch and Chanhyuk was great covering songs from other YG artists. Got 7 is another group with multiple appearances who always make it fun to watch them. There are many unique and strong personalities within the group and they are all fairly competitive leading to enjoyable moments for the audience. The Random Play Dance actually gets harder the more songs you have released so it continues to be fun to watch each time this idol group appears on the show. NCT 127 showed a good performance covering songs from other artists both male and female. I’ve included them as an ‘almost on the list’ as their dancing skills were very good. There are so many other groups who have played Random Play Dance in a fun and entertaining way that this list could easily change from day to day. Do you have an all time favorite? If so please feel free to comment below. Have fun watching Weekly Idol and have a great day everyone. You may also enjoy Kpop: The 100 Million Club, Best Kpop Rookie Groups for 2016, Kdramas : My Picks for 2016, and Korean Variety Show Games, parts 1, 2, 3, and 4. ← Kpop: The 100 Million Club.